Most mushrooms are known super foods with long lists of benefits. 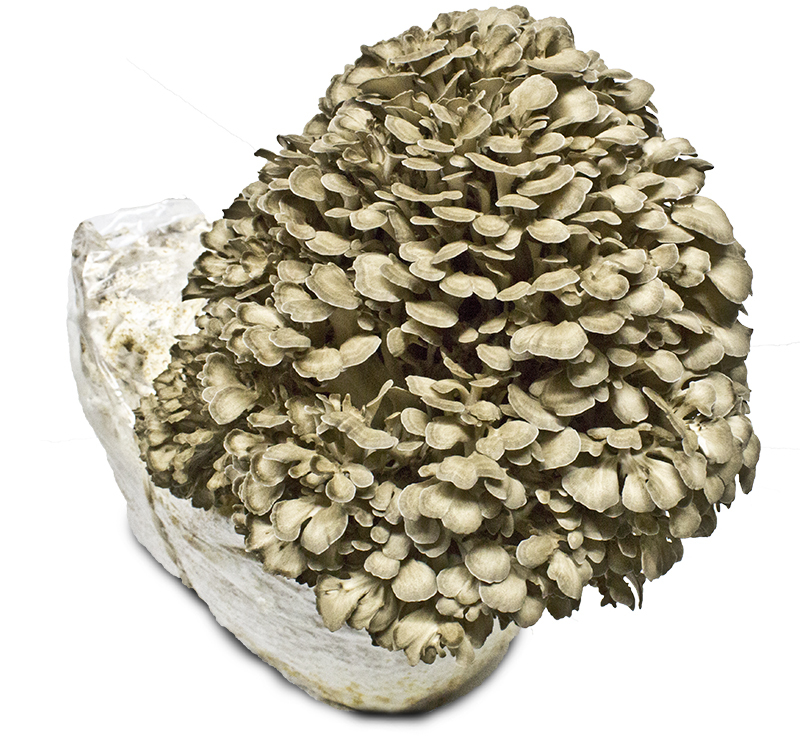 The maitake is one of the most beneficial of all the fungi families. Maitake has been the subject of cancer studies, exhibiting anti-metastatic properties (reversing the spread of cancerous cells). Along with the being known amongst oncologist, it’s also shown promise in diabetes management, immune system stimulation, and contains antioxidants. The Maitake mushroom has earned its spot on top of the delicious super-foods list. Maitake bags follow a similar procedure as most of our specialty bags. A mixture of substrate, in a clear maitake bag, is sterilized. After cooling, maitake spawn is added and the spawn run begins. After about 30 days in a spawn run room, small pins form inside the bag. Our growers select a few of the healthiest looking pins and cut holes around them. 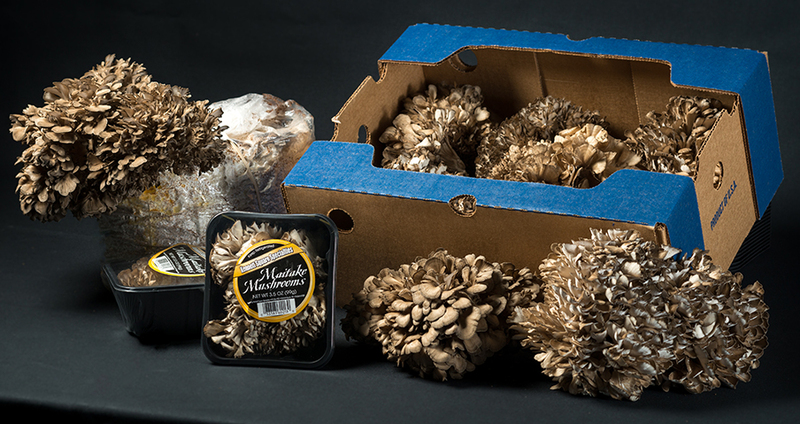 The maitake bag then produces large clusters of maitake over the next 7 to 14 days. Each maitake bag’s production can vary from 1 to 2 pounds. Our maitake spawn was created by Kennett Sq. Specialties mycologist. Just like plants, mushrooms of the same species can have different genetic strains. 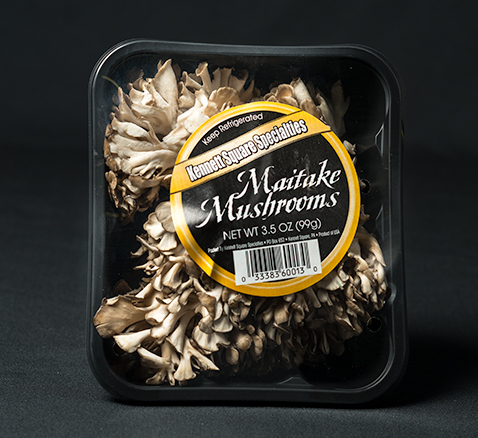 Our maitake bag produces a mushroom that contains a much more flavorful, nutty, and robust taste compared to other maitake strains. We’ve had customer stray to other foreign strains of maitake, only to return claiming “they just don’t taste the same.” Consumers can taste the difference when the mushroom comes from our Maitake bag. Maitake bags follow similar rules as most of our mushrooms. Keeping the maitake bags in a 60-62F grow room with 80-90% humidity is ideal. The maitake bag breathes best when CO2 levels are kept between 800-1000ppm. Upon receiving the maitake bag, pins may already be formed. If none are present, give the maitake bag 3 to 7 days. Select 1 to 3 of the largest pins, and cut holes around them. The excess plastic of the maitake bag can be rolled or folded down. Typically, the more holes that are cut, the smaller the resulting maitake mushroom. Growers will need to decide if they want single 2lb clusters or four half pound clusters off a maitake bag. Harvesting is easy for maitake bags. Simply wait until the clusters of maitake large and leafy. The individual petals should be flat and wide. Brown and tan are good indicators of healthy, ready to pick maitake. Waiting too long will cause the maitake mushroom color to fade to a more pale beige, as well as becoming damp (almost water logged). With Maitake mushrooms being such a high dollar mushroom, the grower will have to balance potential profits vs. customer satisfaction. As growers wait to pick, weight and poundage increase as the quality will decrease. The art of a successful maitake bag harvest comes from knowing exactly when to pick.